Leather-hard refers to a specific stage during the drying of a pot or other clay object. At this stage, the clay is still visibly damp (usually a darkish gray) but has dried enough to be able to be handled without deformation. The clay is able to be gouged or incised without breaking, but will not receive impressions. The leather-hard stage can be further refined as soft leather-hard, leather-hard, and stiff leather-hard stages. Why is leather hard so important in ceramics? Clay has chemically bonded water in it which will cause it to slake down (disintegrate) when a dried clay object is put in water. Once heated (fired) to between 660 F and 1470 F (350 C and 800 C), the clay is converted to ceramic and will never dissolve again. Clay goes from the wet stage (this is fresh from the bag clay that has not yet been worked into). Then the potter will work with their clay either through hand building techniques or on the wheel to create the shape or sculpture they desire. The next part, the drying process, is key. 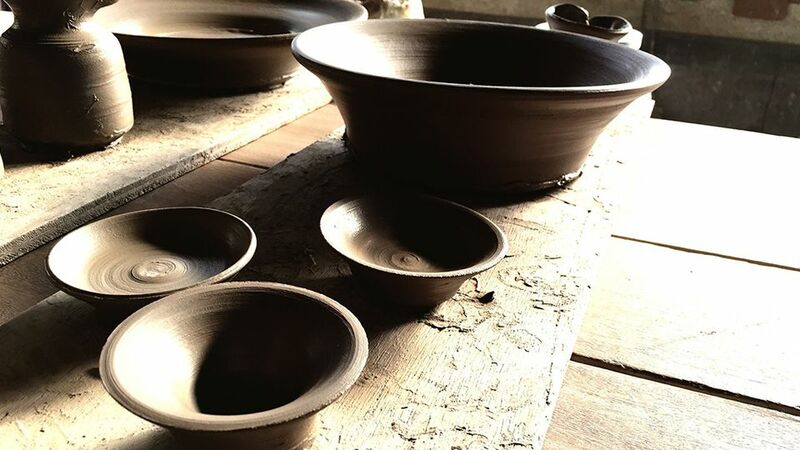 Before your ceramics are ready for the kiln the water must be dried out carefully and slowly; if it’s dried too quickly, it’ll become too fragile and crack before it gets to the kiln and if it’s not dried enough, then it may crack when it is in the kiln. Fast drying causes far too much stress on the piece. Look out for even the tiniest crack before you put your piece in the kiln as it may get even bigger during the firing process. What are the other stages of the drying process? Leather hard is not the final stage before you put your greenware (unfired ceramics in the kiln), there’s also a stage called bone dry, this is when the final moisture leaves the ceramic work and it is as its name suggests dry as a bone. There are then of course, the several stages of leather hard, which are: soft leather hard, this is the stage if you’re making something like a teapot or a cup or a butter dish and this the very best stage to attach on a handle, as the clay is in the optimum condition for scoring and coating on some slip and joining two pieces together. Medium leather hard is the next stage along and it’s very good for decorating, especially if you’re working with underglazes or slips, if you want to carve any decoration into your work, then this is also a good time to do it. Then there’s the final stage of the leather hard scale, which is hard leather hard, it’s during this stage of the ceramics cycle that you can scrape off any excess clay you don’t need or need to tidy up before it turns to the ultra fragile bone dry stage. Burnishing or decorating techniques like terra sigillata are best done at the leather hard stage. How can you tell when a piece is leather hard or bone-dry? Leather-hard greenware is cool to the touch, while you’ll be able to see if a piece is bone dry by the fact its coloring is usually quite a lot lighter. At the bone-dry stage any works you do on the piece are known as fettling, be careful if you are working with clay in this state as it can produce quite a lot of dust, so wearing a mask is recommended. Note that ceramic ware in the bone-dry state is at its most fragile.